The Vivant Alternate is a portable loose leaf with easy to use top filling system, is the perfect vaporizer for any alternative smoker. Say hello to Vivant Alternate Loose Leaf Vaporizer by Vivant. It adopts a Super precise temperature control, good in the hand but strong in function. It’s powered by a single 18650 battery. It's lightweight, small, easy to pocket and easy to conceal. Featured with top LED screen, Airflow control, USB charging, Vivant Alternate will meet your higher demand of strong e-cigarette mod. • It doesn't come with dry herb, you shall buy it separately. • No 18650 battery included. We suggest you use discharge current no less than 30A battery, for example, Sony VTC 4. The Vivant Alternate Loose Leaf Vaporizer truly does exactly what you need it to do. The Alternate already sells at less than half the price as other vaporizers in its class. And the price on BuyBest is half the price as other stores sell the Alternate, brick and mortar or online. The unit came with the 5 minute firmware upgrade. For me the one minute ready window is just how I want it. But the option is there for longer term sit down sessions. The top cap snaps/twists off with a very positive feel. There is an airflow adjustment should you want a tighter draw although I prefer full open airflow. Personally I like the bowl / chamber size. I do not need or want to stuff more into it at one time. Using high quality product with the Alternate has proven to be a perfect fit for my needs. Although you do not feel it, the first 2 to 3 draws are smokey. You just don’t know it until you blow it out. I run mine at 390F. After the first few draws there is not much visible vapor, but there is still potency to be had for the taking. For my use I have not had to adjust screens or anything else. I find no drawback with the materials used, seams are flush, anything that slides, pushes, twists does so with a positive feel. The battery does require minor caution when installing to avoid wear and tear on the wrapper. It becomes an easy issue to handle after a few uses. I easily compare the quality of vaporization to the Volcano, without the huge turkey basting bag to deal with. After vaporizing your product you will find the same tobacco shade of brown with what is left over. You will notice that the color after vaporization is uniformed throughout. A sign of perfect results. This is exactly what it looks like when you use a Volcano. Ignore the mention of conduction, the results are convection. Convection is definitely superior, you’re vaping for a reason and conduction just does not cut it. The recommended batteries are VTC4 30 amp, I have four dedicated to the Alternate. I have tested other batteries such as VTC6, HG2, 30Q, 25R. The Alternate did function perfect with all of them. 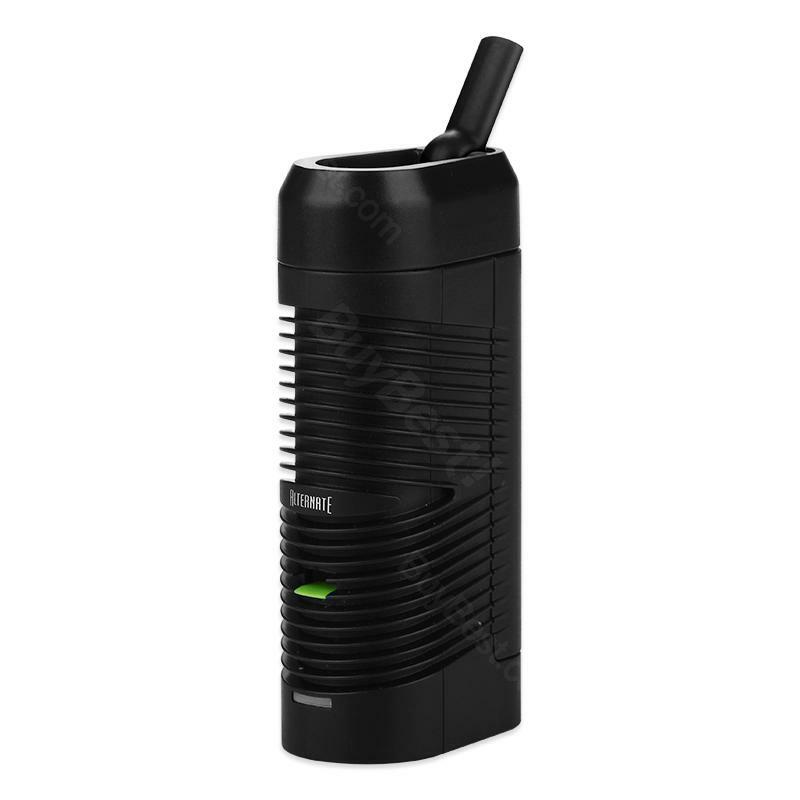 The VTC4 is the best though, for battery life and safety, any good convection vaporizer draws a lot of power. And this is a good one. And the fact that it uses 18650 batteries is a real plus. Not only are the batteries replaceable, they can be charged outside of the vaporizer. That is an option that sets it apart from its closest competitors. The accompanying grinder is specifically designed for loading the chamber, a handy feature. And the brush provided is perfect for maintaining the chamber area. After each use just a real quick and easy brush out keeps it nice and clean. They are not gimmicks, they are well thought out tools, the brush a surprising joy. I actually have no valid critique. The unit itself does get real warm, any convection unit this size will. I do change batteries frequently, but again, any convection vaporizer is going to use a lot of power. I use mine so often I leave the battery door off for quick battery change and additional cooling. Not necessary, but I like it that way. Conduction “vaporizers” use a lot less power, they also apply heat unevenly and a lot worse, they burn it. More like smoking just without a flame. I would not buy the Crafty or Mighty, but I will be purchasing another one of these just as a backup. It is just that good. There just isn’t another battery operated vaporizer I would buy. It’s not a very elegant vape, it feels a little plasticky, but it’s not bad for the price, I think it’s a pretty good value. It’s a comfortable size, shape, and weight. It’s you know, kind of modeled after the Crafty like many vapes seem to be, but it actually has a few important differences, a few things that make it unique. So, first of all it’s cheaper because of the differences in materials, that’s one of the reasons. So, the wall of the herb chamber is aluminum, it’s not stainless steel. The air path is a PEEK polymer plastic. It’s common in a lot of vapes – it’s a high temperature resistant, chemical resistant plastic. The bowl size is actually a little small, it’s a little below average. It’s like ~0.2g-0.25g. So, smaller than the Crafty. It’s enough for what I would say is about 10 draws. So one of the big main differences or unique features of the Alternate is the removable 18650 battery that it’s powered by. I’ve been getting about 35 to 50 minutes of actual usage from each battery charge. So with a vape like this it’s kind of cool because you can get an external battery charger and get a few 18650’s and then you always have power, and that is one nice difference from the Crafty for instance because with the Crafty it’s got the internal battery with micro usb charging only, takes two hours to fully charge, kind of a big disadvantage. Now it does have an auto shut off timer but you can adjust it which is cool. You can adjust it from one to five minutes, and the vaporizer is going to shut the heat off. It’s one of those vapes that when you first turn it on by clicking it five times, the power button, it’s sort of like in standby mode. So you play with the screen, change the temperature, change the shutoff timer, things like that. Then to turn the heat on you hold down the power button for two seconds. So, the LCD display on the bottom is another difference from the Crafty. You can adjust this one in one degree increments which is cool. I use it around 375 Usually they give you a loading tool to help you load it. Easier and keep it clean earn whatever. It’s slightly bulky but it works. If you want maximum vapor production I do as usual recommend grinding pretty fine packing it pretty tight. Now on the subject of packing it tight right the stock screen comes in the top part cooling unit or the mouthpiece part. I wasn’t really too thrilled with it. It was a small screen. I didn’t really like fit extremely well and most importantly it didn’t bulge out at all it was completely flat. What I don’t like about that is that it didn’t put any pressure at all on my herb. When I closed the cooling unit. So I did a little more to the screen than I actually did the same exact made to the Crafty because the Crafty has the same issue in my mind comes with a flat screen up here. Also I just basically took out the stock screen and put in one that’s slightly bigger. And bulged it out a little bit so that now when I close it kind of very slightly tamps down there. Now in my opinion this will maximize vapor production and sort of boost the performance because what you’re doing is increasing the conduction effect a little bit. It’s pretty much a mainly convection vape and produces hot air when you inhale hot air is what vaporizes here. But since the oven is metal it’s going to retain some heat. And if you pack it kind of tight like I do some of that heat will radiate through. It’ll do a conduction effect in addition to the convection. So you’ll get a nice hybrid effect and it works well. You can get a lot of vapor clouds as you can see from my session clips. The taste is pretty decent. You know it doesn’t have the highest quality materials in the path but doesn’t taste plasticky really. It was actually kind of impressed with that. And then the smoothness of the vapor or how comfortable it is that’s also pretty good. Not really any complaints in that department especially for a vape in this price here. This Vivant alternate vaporizer arrived yesterday. Seems working great. Love it. Ordered this vaporizer for my granpa. He is so happy. Thank you. It looks so special. Rember to buy batteries and herb.